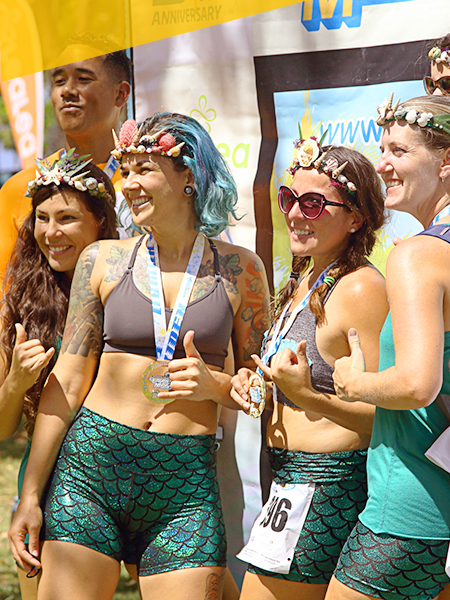 ENTRY FEE INCLUDES: An original design Honolulu Ekiden T-shirt, commemorative finisher’s medallion for all finishers, and post-race refreshments and entertainment. CANCELLATIONS: Your entry fee is NON-REFUNDABLE and NON-TRANSFERABLE. Open Male: Team must consist of all male participants. Open Female: Team must consist of all female participants. Open Mixed: Team must consist of a minimum of one male and one female participant. Masters: Team must consist of members with sum of ages equal to or more than 300. Kama‘aina: Team members must be residents of the State of Hawaii on race day. Family/Ohana: Team must consist of participants who are immediate or distant family members. Corporate/Public Service: Team must consist of members from the same organization. Youth: Team must consist of six participants with the sum of ages equal to or less than 88. Student (Male/Female/Mixed): Student (Male/Female/Co-ed): Team members can be a combination of middle and/or high school participants. Outgoing high school seniors (graduating May/June) can race with their existing teammates in the “Student” division. A mixed team of students (Middle School and/or High School) and/or College will be considered the team category of the oldest participant. If the team has 1 College student and 5 high school students, that will also be considered as a University/College category team. University or College: Team members must be university or college students on race day. Heroes: Team members can be a combination of Military, Police, Firefighter, National Guard, Coast Guard, and/or Life Guard participants.